A cypher is a secret. It’s something that not everyone understands. It holds potential. Promise. The Cypher System is a roleplaying game engine you can use to power campaigns set in virtually any genre. Created for the hit RPG Numenera and later used in The Strange, the Cypher System is lauded for its elegance, flexibility, ease of use, and focus on narrative. And now it’s a standalone rules set presented in the Cypher System Rulebook! The Cypher System focuses on narrative, unleashing the creativity of the GM and players. Some people call it a “rules-light” system, but it has all the power and sophistication of games that are much more mechanically heavy—and substantially more flexibility. 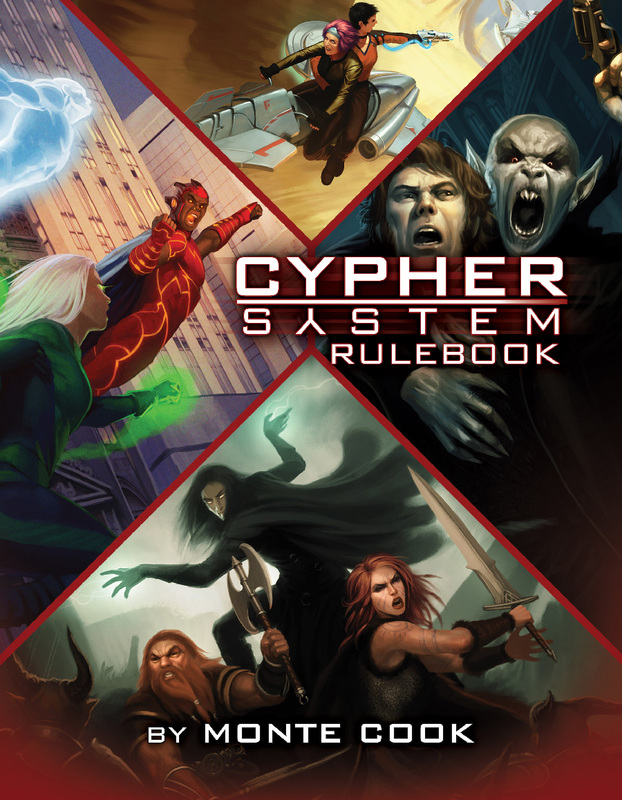 The Cypher System Rulebook gives you 416 pages of character options, equipment, game rules, and special coverage of key genres, creatures, NPCs, and cyphers. It has the complete game rules, along with genre-specific rules and advice for fantasy games, modern games, science-fiction games, horror, and superheroes. Included are systems for issues such as vehicle combat, crafting, and insight, among others. And it provides four new character types (each customizable to the needs of your setting) with scores of options, loads of equipment and hundreds of cyphers and artifacts, and nearly 70 creatures and NPCs. And it caps off with great GM advice on adapting the Cypher System to a variety of settings, and on running a fun, engaging, fast-paced, easy-to-GM game sessions. Start a new campaign set in a fantasy land of elves and fae creatures, a science-fiction setting spanning the galaxy, or a modern slasher horror game—or add scads of new options to your Numenera or The Strange campaign. The Cypher System Rulebook gives you everything you need to run the game you want to play using the critically acclaimed, award-winning, and just plain fun-to-play Cypher System!